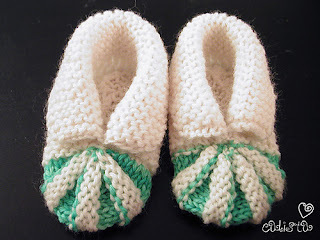 I made these shoes as my friend's baby shower gift based on the pictures of FO's and the progress shots on Ravelry, since I couldn't get the original pattern anywhere. After finishing this project, I found that I made a little less numbers of ridges at the toe than the original, but I like it as is. Work 26 rows in garter st.
2nd decrease row: k to last 3 sts, k2tog, k1. 1st increase row: k to last 1 st, m1, k1. Work 25 rows in garter st.
Next row: BO 9sts, k to the end of the row. With contrasting color, work 4 rows in st st.
With main color, work 4 rows in rev st st.
Rep these 8 rows 3 more times, and work the 4 rows of st st in contrasting colors once more. This is how it should look like from the wrong side when it's done knitting. Fold it where the lines are drawn. Graft stitches on the needle and the cast-on edge using kitchener stitch technique. Then you will have something like this. Sew the top edge of toe part using running stitch. Pull the stitch tight to gather the top edge. Sew the bottom edge of the toe part same way. Graft the bottom edge of the bootie. Sew half stitch from each side to make the seam allowance as narrow as possible. Sew couple of stitches at the bottom of the opening to make the ankle part stand up better. Now you are done! :) Repeat the other side and admire the cuteness! I love these booties! I'm going to have to try these. Thanks so much for sharing you pattern! They're great! Beautiful job! These will definately be my next project. Thank you for taking the time to share your pattern. It's much appreciated. Just not sure I understand how you sewed couple of the begginnig of the opening? I just simply sew the openings with a tapestry needle. I am also at the same point as Marian. Do you cast off then sew?? 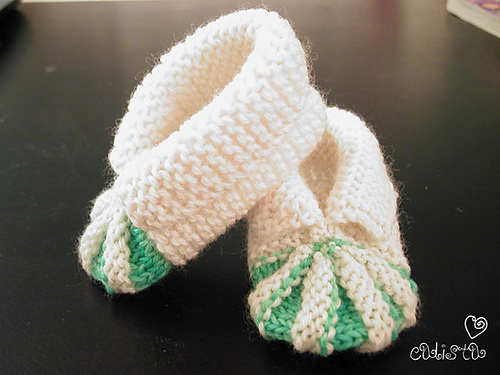 I am new at making baby booties and am a little intimidated. Any help would be appreciated. Sherry at wolfoundmom1@cox.net. I just sew the seams (where marked with heart shapes) without binding off using kitchener stitch, so that the seam can be thinner. If it's easier for you, you can first bind off and then sew. But it will give you a slightly thicker seam. 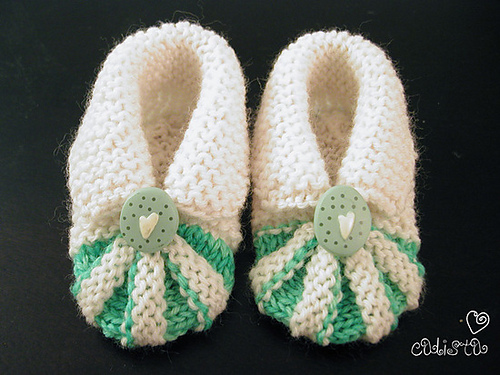 I have just finished making these booties and they have turned out super cute..thank you so much for sharing the pattern.God bless. Thanks so much for the pattern! Adorable and thank you for the pattern!Keep up the good work! love these booties. would like to see a picture of the bottom. don't understand...do you gather the bottom and the top of the toe? then how do you attach the gather to the bottom? Since my flickr account died (without notice)and the photos were gone,I got several inquiries on how to sew the bootie together. Due to my crazy work schedule, it took me a while to finally got around and knit one and take photos. Sorry for the delay for those who been waiting for my reply. Instead, this time I made a super detailed step-by-step instruction. I hope it's more helpful. Thank you for your comments! I'm happy that you enjoyed my pattern. Yes, I'd love to see your projects (and your twin grand daughters)! SSK means "slip, slip, knit 2 slipped stitches through the back loop". It creates a decreased stitch that slants to the left side. what does the phrase "bootie call" mean?!? I didn't make a crochet version, but I think you could convert it to a crochet version by looking at the flat (before sewing) shape. Thanks for the detailed showing as related. I really liked it. I tie it to my little granddaughter. BO is acronym for "Bind Off"
I would love to Crochet these booties also. Has anybody made them in Crochet yet? I would love to have the instructions, too. Thanks for posting everyone. I do want to thank you for sharing your instruction and how to make these. It is Much Appreciated. Thank you so much for doing this!!! I have been looking for a pattern for these booties for ages!